Title text: Superman lies near the bird/plane boundary over a range of distances, which explains the confusion. This comic is about Planet Nine, a possible Neptune-sized planet far beyond the farthest planet, Neptune. Astronomers Mike Brown and Konstantin Batygin published a paper on 2016-01-20, only two days before the release of this comic. The paper is called Evidence for a Distant Giant Planet in the Solar System and shows indirect evidence that such a planet may exist, inferred from an otherwise unlikely correlation between the unusual orbits of several dwarf planets. See for instance also explanations, for the layman, of the results here: Astronomers say a Neptune-sized planet lurks beyond Pluto and Planet X Discovered?? As this paper came out on the day of the previous comic's release (1632: Palindrome), this comic's release day was the first release day after the news came out. This explains why this comic was released in the late afternoon rather than just past midnight as is often the case with normal releases. Once Randall heard this news, he had to decide to do this comic instead of the scheduled comic, and then invent and draw a completely new and actually very complicated comic (resulting in several position errors) about "Planet X" before he could release this comic. Now this planet could be called Planet IX (and is labeled Planet nine? on the chart), as Pluto, the previously "planet 9" has been degraded to a dwarf planet. The "X" did, however, not only refer to the roman numeral! 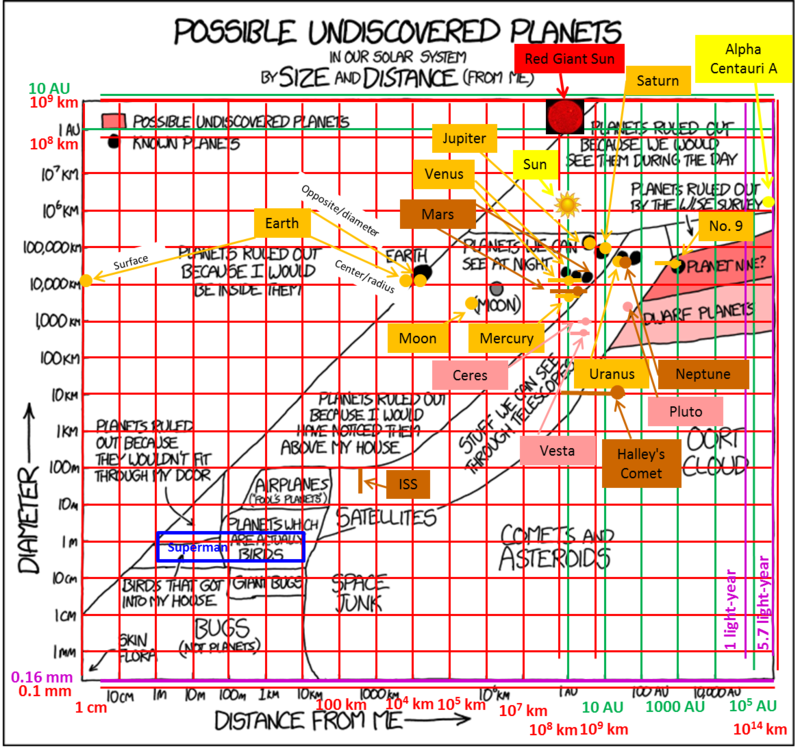 Note that Mike Brown is the astronomer that killed Pluto, or at least reduced Pluto to a dwarf planet, something that has been a subject in xkcd before; see for instance 473: Still Raw. This was the first of two times within a month where a new astronomical announcement (of something discovered months before the actual announcement) resulted in a related comic. The second being 1642: Gravitational Waves. But in that case Randall seemed to know about it in advance, as he even changed the normal release schedule to post the comic on the day of the announcement, unlike here, where he seems to have been forced to make a new comic up on the fly. Stating the obvious, this log–log plot shows that for an object to be an unknown planet it has to be very far away, since planets are big, to explain why we haven't seen it yet. With the log scale it is possible to go from a diameter of less than 1 mm to an astronomical unit (AU) on the Y-axis and from a distance of just 1 cm up to thousands of AU on the X-axis. Randall's chart is very egocentric as it categorizes objects based on size but also on their distance from himself ("from me"). This distance starts at 1 cm, and an item on the chart reads "skin flora", thus distance is measured from the surface of Randall's body (skin/eyes) rather than from his center of mass. All the planets (and moon) that are marked on the chart are so far away that it will not matter if the distance is measured from Randall's surface, his center of mass, or by the way anywhere on Earth. Also, the planets' diameters are so much smaller than the distance from Earth that their real size would hardly take up any space in the chart due to the log-scale. The dots marking these 7 planets are thus not drawn to scale that should represent their actual size compared with the other planets. But their distance from Earth (and Randall) is not constant even on the log-scale, especially not for the nearest planets, as they can be on either side of the Sun compared to Earth. The chart correctly states that if there was a planet that was at a distance from him smaller than its diameter, he would be inside it (although at the bottom of that region, it's more like the planet that would be inside him, as this line goes down to a diameter of 1 cm). If the distance is to the planets center, this would also fit if he was only a radius away from the planet. As Randall is not inside the Earth but really close to it, Earth is correctly positioned on this line. However, for Earth, which is marked with the largest of the dots, he seems to have put himself a full Earth diameter away from Earth. Even using the center of mass of Earth as it's position he should only have been 6,350 km away from it, but now he places the measuring point of his distance to Earth on the opposite side of the Earth so his distance to it is equal to its diameter (which would make a choosing a distance of 0 km just as correct). Earth is just left of the 10,000 km line on both axis, and Earth has a diameter of 12,700 km, which will fit fine with the center of the dot, but not with the distance which should have been the maximum distance Randall could be from it (0 or 6350 km depending on the definition of distance from Randall). The IAU definition of planet requires a solar orbit, gravitational rounding, and "clearing the neighborhood", a controversial (at the time of its introduction) calculation of relative size that excludes Kuiper Belt Objects such as Pluto. The calculation regarding Planet Nine would make it large enough to meet the IAU definition. Using this definition the chart quickly rules out birds and bugs, although at a glance they could be mistaken for planets, something that is especially the case for planes (at night) which are even called fool’s planets’ in the chart, a reference to fool's Gold. Note that anything that is actually on Earth is positioned within 60 km from Randall. This is because if it is further away he cannot see them due to the curvature of the Earth. This does not mean that he intends to indicate that they cannot be further away from him than that. The already known planets are prominently marked on the chart. They are the solid black dots. Besides Earth and Planet Nine?, the bottom row of three small dots are Mercury, Venus and Mars. The top row of four larger dots (but smaller than the dot that marks Earth) are (from left to right) Jupiter and Saturn (visible to the naked eye) and Uranus and Neptune (visible through a telescope). It is unclear how Randall is calculating these distances, especially to the three terrestrial planets, since neither of these options work: closest approach, average, mean, current or maximum distance. In the comic 482: Height Randall shows (among other) the distance from the Earths surface to all the planets. For especially Venus and Mars he shows that their distance changes a lot based on theirs and Earth's orbital positions. But he has neither used these loops to base the dot size or position, as these loops clearly go closer than 1 AU and only one of the planets are drawn closer than that. It is thus unclear which of the three represents which planet, but in the table below it has been reasoned that the dot situated at the largest diameter of the three inner planets planets should represent Venus (12,000 km) as it is almost twice as big as Mars (6,700 km), which on the other hand is more similar to Mercury (5,000 km) and given that the two dots furthest out are almost the same size, it would make most sense if they represent Mercury and Mars. Since the outer dot never comes closer than 2.5 AU and Mercury never gets further away than 1.5 AU it makes most sense to place Mercury as the middle of the three and Mars as the outer of the three dots. Below some objects are mentioned that are not on the chart, and also other errors in position (probably due the hasty creation of such a complex comic.) Many of these objects as well as the planets with the errors mentioned clearly revealed can be see in this modified image, which is also inserted and explained in the trivia section below. Pluto, no longer considered a planet (it was the ninth until 2006), is not marked on the chart, but it would be below Neptune just outside the pink region (2,300 km diameter and 30-50 AU away). This makes sense since that region is for dwarf planets not yet discovered and any one as big and close as Pluto would have been discovered by now. There is are thus also other dwarf planets that would not belong in the pink region, one of them is even much much closer and is easily visible with a telescope: Ceres, which would appear roughly below Mars and Jupiter. (950 km diameter and 1.5-4 AU away from Earth). But this pink region is there to show where there could (and most likely will) still be undiscovered dwarf planets. The Moon is also marked on the chart, with a gray dot (almost as large as the gas giants dots). The name is written in brackets since it's not a planet (because Earth is clogging up its neighborhood). Randall has messed up the positioning and the diameter of the Moon as it is clearly positioned past a million km, and it is only up to 400,000 km away from the Earth. The Sun is not marked at all, even though it is extremely prominent, but as it is clearly not a planet it is left out. It would per definition have been at a distance of 1 AU, and with a diameter of 1.4x106 km it would be well inside the region of things that we can see during the day. Note that objects this big will always be shining, already a large planet such as Jupiter is brighter than if it could reflect 100% of Sun's light. In general, planets ruled out because we would see them during the day refers to objects big enough to be stars or brown dwarfs, but the only star system, other than Sun, that would fit on the chart is Alpha Centauri, which at 4.37 light-years (ly) is well within the right boundary that falls at 5.68 ly, just before the distance to the next nearest star Barnard's Star at 5.96 ly from the Sun. A light year is 63,241 AU, and with the 10,000 AU mark far from the right edge of this log-log plot, it is clear that also 100,000 AU and thus a light year is within the chart. And this also goes for 5 ly. "Planets ruled out by the WISE survey" refers to the Wide-field Infrared Survey Explorer (WISE), a space telescope designed to look for warm objects such as brown dwarfs, which generate heat at their centers. It was capable of detecting Saturn-sized or larger planets in the outer reaches of our solar system, but did not find any. WISE would not have detected "Planet Nine" (even if it exists) because it is too small and thus too cold to be detected. There is a chance that it can be seen in some more temperature sensitive measurements. But these have not been checked for such a planet yet, (see here). The word satellites is written on the border of two regions indicating that these can be in both regions. Some are small enough (10 cm) to be comparable to the space junk below, (see cubesats), others are much bigger and would fit in the region above: Stuff we can see through telescopes. Although it may not be called a satellite in daily talk, the International Space Station is in fact a satellite, which is over 100 m in the longest direction. It would thus be on the border to the Planets ruled out because I would have noticed them above my house region just above the "A" in satellites (400 km above the surface). Some satellites can be seen without a telescope, like the space station. This table lists the limits of all regions and dots in the image. Some of the more stretched out regions has also been split into two or three smaller parts. The planet dots has the limits from the edges of the circle the dots makes used for maximum and minimum limits. The table is sort-able, taking care of units even though these change throughout. The data has been read out using the image inserted and explained in the trivia section. Note that superman is also drawn in on this image. The wiki links included below may have been used in the explanation above. They are only used once in this table though, but not necessarily the first time the word is used. And brown dwarfs first from the WISE region etc. Planets ruled out because I would be inside them 012 !1 cm 02800 !109 km 0170 !1 cm 0440000 !109 km Planets that would either have Randall inside or, if smaller than Randall. would be inside Randall. Earth comes close since Randall is on its surface (most of the time). The line dividing this region from the Planets we see at night hits the Y-axis at 1 cm and then goes to the top at almost 10 AU. A dot representing Earth is on this line at around 12,700 km = Earth's diameter. This is strange since this means that Randall is 12,700 km from Earth. Of course this is how far he is from the far side of the Earth, but more logically it would either have been 6,350 km (from Earths center) or 1 cm, since his surface, that is his feet, touches Earth, except for the soles of his shoes. Planets ruled out because they wouldn’t fit through my door 0140 !1 m 012 !60 m 02300 !1 m 0190 !60 m As these "planets" are more than 1 m in diameter it is likely they would not fit through his door. It is assumed that if a planet were within 60 m from Randall that they would be within his house, but because objects in this triangle can't fit through his door,even though they should be in his house, they couldn't be in his house, and thus they can be ruled out (they do not exist). The real planets would of course also not fit through any door. Birds that got into my house 013 !20 cm 011 !60 m 0190 !20 cm 0140 !1 m Small birds that get into Randall's house. They are not planets… He has a fairly big house as they can be 60 m away from Randall (when he is inside) and still be inside his house. Bugs (Not planets) 0160 !10 m 0130 !1 km 016 !1 mm 011 !1 cm This is only the approximate region where the words Bugs (not planets) are written. As the skin part probably is at the origin, the whole region is probably related to bugs. See above for the size of this region. Skin flora 010 !1 cm 010 !1 cm 010 !0.15 mm 010 !0.15 mm There is an arrow pointing to the corner of the diagram. The values are thus the same for min. and max. as it is a point value. Of course it may also mean that they are outside the chart, closer to Randall (i.e. on his skin) and smaller (i.e. they are not visible), but this is not clear. Giant bugs 0190 !100 m 0150 !10 km 0180 !3 cm 013 !20 cm Giant bugs are for Randall from about 5 cm. It seems like he tries to keep them at least 100 m away. The limit of 20 cm doesn't cover the range, as some spiders reach 30 cm leg span, and the length, with antenna, of some insects may surpass 25 cm. Planets which are actually birds 0170 !60 m 0170 !45 km 0200 !20 cm 0160 !8 m Birds bigger than the birds that can get into Randall’s house, and up to the biggest possible birds (and even bigger). These are so big that they actually look so much like planets that you have to be told that they are actually just birds. Comets and asteroids 0280000 !105 km 0350000 !100 AU 013 !0.15 mm 02300 !225 km This is only the approximate region around where the words comets and asteroids is written in this large region. It goes from halfway to the previous label for Space junk and halfway to the next label for Oort cloud. The max diameter is taken at this last point. A small part of this section just reaches into the Dwarf planet territory, making sense as Ceres is a dwarf planet in the asteroid belt which lies in this distance range. However, Ceres is much closer to Earth than the dwarf planet region. But that region is also the one where undiscovered dwarf planets should be! The main concentration of asteroids in the belt is between Mars and Jupiter. A very slim region in this log-log chart! Ceres is the only dwarf planet in the belt. The largest asteroid is Vesta which is not gravitational rounded even with a diameter of 500 km. It would not fit inside this part of the chart due to its size (and distance of 2.4 AU). The best known comet is Halley's Comet which returns every 75 year (next time in 2061). At that time it is much closer to the Sun than Earth at just 0.6 AU, but in 7 years time when it is the farthest away it will be out at 35 AU, further out than Neptune. But is it only of the order of 10 km in diameter (11 km in mean, 8 km x 15 km). So it can only be seen when close to the sun for a few months. This comet would fit inside this region for most of the time, when it is more than 2 AU from the sun, above the word "and" near the top of this part of the region over that word. Oort cloud 045000000 !1000 AU 04000000 !1 ly 015 !0.15 mm 02500 !500 km For distance this is only the region where the words Oort cloud are written in this large region. This fits with the Wikipedia article that puts it in this range from 1000 AU to more than one light-year (ly). The Oort cloud is speculated to stretch as far as 2 ly out from the Sun. It may even be so that the far edges of the cloud overlaps with similar clouds from the nearby stars, which are 4-6 ly away. Satellites 02600 !100 km 02300 !105 km 02200 !1 m 0180 !10 m This is only the approximate region where the word Satellites is written. The words cross the border between the Space junk etc. region below and the Stuff we can see through telescopes region above. In principle it could thus go down into the space junk region and reach the 10 cm diameter of a cube sat, and up to the size of the International space station (100 m). Stuff we can see through telescopes 02500 !60 km 0370000 !800 AU 02600 !1 m 041000 !430,000 km The max and min. values are not very representative as the region follows a shifted diagonal. Close items can be seen with telescope even if they are small, and large object might not be visible if they are far enough away. Hence this section has been split in three, see below. At the top left of the region there are two dots representing Uranus and Neptune, the planets not visible to the naked eye. Stuff we can see through telescopes (over satellites) 02400 !60 km 02200 !105 km 02400 !1 m 02100 !1 km This section has been split in three, see the entire region above. This is objects in the satellite range. Stuff we can see through telescopes (over asteroids) 0300000 !106 km 030000 !10 AU 02800 !30 m 02800 !20,000 km This section has been split in three, see the entire region above. This is objects in the asteroids range. Stuff we can see through telescopes (Past asteroids) 03800000 !10 AU 0380000 !800 AU 030000 !100 km 042000 !430,000 km This section has been split in three, see the entire region above. This is objects in the outer planet range. Here are also the two dots representing Uranus and Neptune, the planets not visible to the naked eye. The reason the upper cut of it at (almost) the same level through all this region it that if the "planets" got any bigger, then they would turn into brown dwarfs that could be seen during the day, or if they got even bigger they could even turn into a small star (or big star see below), and thus would be visible by day. Region with both planets above house and visible at night 0180 !60 m 033000 !43 AU 02500 !3.5 m 038000 !300,000 km The max and min. values are not very representative as the region follows a shifted diagonal. Close items can be seen with the naked eye at night even if they are small, and large object might not be visible if they are far enough away. Hence this section has been split in two sections as there are two labels, see below. At the top left of the region there are five dots representing the five planets visible to the naked eye. Also the moon is shown with a gray dot (i.e. not a planet), this is more in the middle of the region, and finally the Earth is on the border to the region to the left, with planets that Randall would be inside if they did exist. Planets ruled out because I would have noticed them above my house 02100 !1 km 02000 !105 km 02900 !100 m 02200 !10 km This is only the approximate region around where the words of this part of the region are written in this large region. Just to show how much smaller the limits are in the small scale of the region. However, this entire region is about things that are visible at night, including the five planets and the moon. Those can be seen as labels for the dots, not another label for the region. Also Saturn is above Randall’s house when he sees it! Of course this also goes for any another bright object down to only 1 km above his house. But anyway planet or not he would be able to rule it out as a new planet, as if there were any that close and this big they would have been spotted long ago. Planets we can see at night 0320000 !108 km 031000 !10 AU 035000 !10,000 km 040000 !300,000 km This is only the edges of the region of the five dots representing the five planets visible to the naked eye. They do belong to the region of planets Randall can spot from above his house, and as such this section may just be a label for the five planet dots, and not for any special part of the entire region. But the limits here are interesting to compare with the entire region or with that of the part with smaller dimensions as shown above. The reason the upper limit cut of at the same level through all this region it that if the "planets" got any bigger, then they would turn into brown dwarfs that could be seen during the day, or if they got bigger they could even turn into a small star (or big star see below), and thus would be visible by day. Planets ruled out because we would see them during the day 0290000 !360,000 km 04200000 !5.7 ly 0450000 !360,000 km 0450000 !109 km This region covers object that are either brown dwarfs close enough to us that we could see them (even by day) or if even bigger real stars, that would be closer to us than almost any other star system. The upper limit is at the top of the chart which almost reaches 10 AU. The Sun fits into this region (at 1 AU per definition and at 1.4x106 km), but is not depicted. It still fits in even when it turns into a red giant, after its main sequence when it has exhausted its hydrogen, then it will swell up to a diameter of 2 AU and not only swallow the two inner most planets but also likely reach out to Earth. But there are also stars swelling up to more than 10 AU (UY Scuti is the largest known star, it has a diameter of almost 16 AU). The max. distance actually reaches the nearest star system of Alpha Centauri. And the biggest of those stars would be inside this last region, as it is 1.2 times bigger than the sun, and thus have a diameter of approximately 1.7 106 km, and they are "only" about 4,37 light-years (ly) away and the graph goes to 5.7 ly. But these stars are definitely not visible during the day. If the graph had stopped at 10,000 AU, at the last tick, this may have been true, but now it is an error, as stars in this entire region will not be visible during day time. But they would at night, if not by eye then by telescope. So no planets in this region, and also no undiscovered objects of that size! Gray Dot: (Moon) 0310000 !1.3x106 km 02400 !3x106 km 033000 !5,000 km 02600 !12,000 km This dot represents the Moon. It is gray and moon is written in brackets to indicate that it is not a planet. Randall seems to have misplaced the dot completely. The Moon has a diameter of 3,400 km and the min limit is 5,000 km. It is even worse with the distance which is a factor 10 too large, at least at the max. The moon is on average 380,000 km from earth, and at the max distance is 406,700 km, to which Randall can add 6000 km when on the other side of the Earth to get him about 413,000 km from the Moon (but then he cannot see it). However, the minimum distance given is more than one million km, and thus more than a factor two of, and the max distance is almost a factor 10 off. The max and min given here is at the limit of the circle the dot makes. Dot 1: Earth 027000 !12,000 km 0190 !32,000 km 034000 !12,000 km 02900 !23,000 km This dot represents Earth. The Earth has a diameter of 12,700 km and Randall is on top of it, thus distance is zero. Thus the dot makes no sense. The max and min given here is at the limit of the circle the dot makes. Dot 2: Venus 03300000 !0.8 AU 025000 !1.2 AU 038000 !15,000 km 03200 !30,000 km This dot either represents Mercury or Venus, as they are the one closest to 1 AU from Earth. Mercury comes closest to this limit as it never gets far from the sun and thus also never strays far from being 1 AU from the Earth. The range of distances from Earth is from 0.5 to 1.5 AU, with Venus coming close to this with a range from 0.25 to 1.7 AU. The max and min given here is at the limit of the circle the dot makes. And for the distance this is within the limits for both Venus and Mercury's orbit. However, the diameter of Mercury is only 5,000 km and this does not fit well, so from that principle it fits better with Venus. But Venus can be much longer from the Earth when on the other side of the sun, and with a diameter of 12,000 km it doesn't even fit well with Venus. However, since Mars, the third planet is much closer in diameter to Mercury than Venus with 6,700 km, and two of the dots are of equal and smaller size, it makes most sense that this planet is Venus. Dot 3: Mercury 03400000 !1.2 AU 026000 !2.3 AU 037000 !12,000 km 03100 !25,000 km This dot either represents Mercury or Venus, as they are the one closest to Earth. Venus can get closer to the Earth when they are on the same side of the sun. The range of distances from Earth is from 0.25 to 1.7 AU. The max and min given here is at the limit of the circle the dot makes. The distance for this dot fits equally bad with both planets. The diameter is smaller than before, but it is still way too big for Mercury’s 5,000 km and it is not too small but just at the limit of the 12,000 km of Venus. This does thus fit better with Venus on both parameters. But Mercury is similar in size to Mars, the third dot, and the second and third dot are at the same diameter, which makes it more likely that the larger diameter for dot 2, should belong to Venus, making this dot Mercury. Dot 4: Mars 03500000 !2.5 AU 027000 !4.7 AU 036000 !12,000 km 03000 !23,000 km This dot represents Mars. Mars has a diameter of 6,700 km and, so here it is set to at least double its diameter. The max and min given here is at the limit of the circle the dot makes. The range of distances from Earth is from 0.4 to 2.7 AU. The min distance at least is lower than 2.7 AU thus making this the dot that fits best with Mars. Because putting Mercury at a dot well past 2 AU would simply not make any sense, even though Mars can actually get closer to Earth than Mercury. Dot 5: Jupiter 03600000 !2.6 AU 029000 !6.7 AU 0440000 !100,000 km 037000 !240,000 km This dot represents Jupiter. Jupiter has a diameter of 140,000 km so it falls within the range. The distances from the sun is about 5 AU and thus from the Earth it ranges from about 4 to 6 AU. This dot thus fit nicely on both parameters with the largest planet. The max and min given here is at the limit of the circle the dot makes. Dot 6: Saturn 03700000 !6.7 AU 032000 !13 AU 042000 !53,000 km 036000 !126,000 km This dot represents Saturn. Saturn has a diameter of 120,000 km so it falls within the range. The distances from the sun is about 9-10 AU and thus from the Earth it ranges from about 8 to 11 AU. This dot thus fit nicely on both parameters with the 2nd largest planet. The max and min given here is at the limit of the circle the dot makes. Dot 7: Uranus 04000000 !21 AU 034000 !43 AU 041000 !38,000 km 035000 !83,000 km This dot represents Uranus. Uranus has a diameter of 50,000 km so it falls within the range. The distances from the sun is about 18-20 AU and thus from the Earth it ranges from about 17 to 21 AU. This dot thus just reaches down to this distance, but it is within the limits on both parameters. The max and min given here is at the limit of the circle the dot makes. Dot 8: Neptune 04100000 !45 AU 0360000 !100 AU 040000 !37,000 km 03400 !83,000 km This dot represents Neptune. Neptune has a diameter of 49,000 km so it falls within the range. The distances from the sun is about 30 AU and thus from the Earth it ranges from about 29 to 31 AU. This dot is thus too far out on this parameter. The max and min given here is at the limit of the circle the dot makes. Dot 9: Planet Nine? 044000000 !700 AU 0390000 !1550 AU 039000 !21,000 km 03300 !50,000 km This is the dot representing the possible undiscovered planet that is the reason for this entire comic. As it is only speculations made on well documented features of dwarf planets' orbits, nothing much is known. But the guess is that it has a diameter between 26,000 and 52,000 km (fine with the dots min and max) and although it could get into 200 AU this may take thousands of years, and it is expected that it will be further out than 700 AU most of the time going all the way out to 1200 AU, so this dot fits perfectly with the newest estimates. Superman (title text) 0150 !1 m 0140 !10 km 0210 !50 cm 0150 !2 m The limits are set as Arms length away (shaking hands with Randall), and he cannot be seen much more than 10 km away (like for big birds). He is about 2 m high and 0.5 m over the shoulder. This does not fit very well with the title text, as he is not even near the plane limit, but still at a distance it can be hard to tell if the flying object is a plane far away (on Earth scale) or a man closer or a small bird really close. This image was used for obtaining the data in the table above. The image was created in a power-point slide show and moving lines along and reading out the position gave the values, with the help of Excel. Values for the lines have been added both for those without ticks but also for ticks without values in the comic. Lines have been color coded, so red for metric, green for AU and purple for units that is not used in the comic. Superman has been drawn in as best as possible in blue (should probably have gone out to 10 km as for big birds, and closer by for a hug). An updated version with many more details have been added since the first version. See more details below the image. New features in the image include more precisely marked dots of the planets and other objects. The dots used for planets or objects are always larger than the diameter range, and centered on the average diameter and average distance. All the diameters used here have been taken from the relevant Wikipedia page. The same orange color has been used for all planets and the Moon, except when two planets are too close on the log-log plot to be clearly distinct if the same color, then one is brown for only this reason. Images have been used for the suns two states and a yellow dot for the only other star. Or the diameter (which is used in the comic) as the farthest distance from Randall is the opposite side of the Earth. Which needs to be opened as a new page to not return to this page. The Moon’s distance range is small enough to be within the dot. For the three terrestrial planets the distance varies so much that a bar has been added through the dot placed at the average distance, to indicate the range of distances. The distance is centered on 1000 AU and it is expected to be between 700 and 1200 AU away, which is covered by the dot. But it could be as close as 200 AU. But if it where we should have detected it by now. There are several planets/objects that are very far from the mark. The moon is far off on both parameters. All three terrestrial planets are way off. Except of course if the 2nd planet is Venus, then the deviation for that one would not be too bad. Jupiter is spot on, Saturn not far away and Uranus close enough. But Neptune is so close to Uranus on both parameters on the log-log plot, that this probably explains why it has been placed quite of the mark distance wise. Pluto has been included and it is not within the pink Dwarf planet region. This makes sense as it has been discovered, and any object this large and that close would have been discovered by now. Thus again indicating that this region is the region of Possible Undiscovered Dwarf Planets. As they can be seen in telescopes and are the two largest objects in the belt this makes sense. Their distance range is indicated with bars and ranges this wide since their distance from Earth depend drastically on which side of the sun they are. Halley's Comet has been added and here a large bar is needed to indicate the distance. The distance from the sun has been used, as it can get very close to the Earth when passing it on the way in. The diameter is ranging from the height of 20 m to the width of 108 m (length 73 m). This is a case where an actual real object would put Randall inside them. As can be seen the Sun as a red giant would be in the Planets ruled out because I would be inside them, as it in the end will reach a diameter of about 2 AU, it will thus reach out to Earth (as the radius is 1AU). Again the way this zone is depicted using diameter rather than radius makes no sense, since the 2 AU diameter sun would only just reach out to Earth, and not out to Mars. It would make more sense to locate the red star on the boarder of this zone, which would have been the case if Randall had used radius rather than diameter. The nearest star, Alpha Centauri A, has also been included. Thus only the largest of the three stars in that star system is shown. The other two stars are smaller than the sun, and the same distance away when compared to the total distance. I added the stars statement before reading your comment. Feel free to edit it. This page was last edited on 4 September 2018, at 23:49.